"Puff" is one of those splendid words in the English language. It can be used in multiple situations, as it is a word that is somehow both vague and precise at the same time. Puffs of smoke, cheese puffs, puffy shirts. It is also really fun to say. Puff. It sounds so fluffy and billowy, like a gust of wind is going to swoop down and whisk it away. Puff is also the term we use for Jiji's paws. Jiji is our short cat with short legs and tiny white little paws (mostly - hello toe spot!) that are basically rendered useless by their tinyness. And we just adore them. Don't they look like tiny cottonballs? Then we have these puffs. Puff pastry stuffed with a savory herb and mushroom mixture. Maybe not as adorable as the previous puff you've seen, but thats okay. Instead of being prized for their cuteness, they tend to be devoured quickly and immediately. Also a good quality. Try adding some creme fraiche as a cool, refreshing dip. To hydrate the porcini mushrooms: Pour the boiling water over the porcini mushrooms and allow it to sit for at least 2 hours to soften the mushrooms. Once the mushrooms have softened, chop and set aside. Reserve the mushroom liquid. Melt the butter and olive oil in a large sauté pan over high heat. Once the butter has melted and the bubbles in the mixture have started to subside, add the chopped mushrooms. Stir continuously, allowing the mushrooms to absorb the butter and oil mixture. After a few minutes, the mushrooms will brown. Once that happens, reduce the heat to low and stir in the garlic. Let that cook for 30 seconds to a minute, then add in the chives, parsley, and thyme. Stir in the mushroom liquid, port, and soy sauce. Add a pinch of lemon zest and some lemon juice for a bit of freshness, and adjust salt and pepper to taste. Take off heat and let the mixture cool. Heat oven to 400 (or whatever temperture is recommended on your puff pastry dough). Cut the puff pastry into four squares by slicing horizontally and vertically with a pizza cutter. Then cut each square into two triangles by slicing on a diagonal. You will have a total of 8 triangles. Place about 1 1/2 tablespoons of the filling on each triangle, bring the opposing edges over and seal the puff into a triangle shape. You may want to use just a bit of water to help seal. Whisk the egg and milk and brush the mixture on each triangle. Bake for about 15 minutes until golden brown and puffy. serve with creme fraiche and herbs, if desired. Lol awww kitty puff paws! And those mushroom puffs look amazing! And I would LOVE these too! YUM! I saw you on RecipeNewz and as a mushroom lover, I had to click over. Sounds wonderful! Jiji is super cute too. "puff" appetizers are some of my favorite kinds! 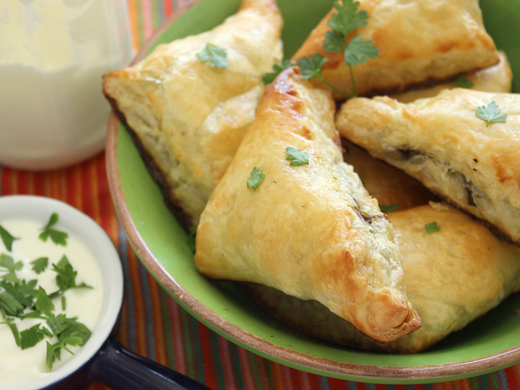 These mushroom stuffed ones sound majorly delicious! Your cat is so adorable! And I love any dish with the word puff... just the word makes my mouth water! Ohh my god I am dying over that picture of your cat. I can totally see why you'd call its little paws "Puffs"...so freakin' cute! The mushroom puffs look divine as well. You've done it again! So cute! (Both the cat and the puffs lol). I like the idea of doing these puffs as sort of mini muffin appetizers, I think I'll try it for my next dinner party. The crust looks golden and perfect and the filling sounds amazing! Love,love mushrooms! Mmm, delicious! I love mushrooms with thyme, and the pastry looks lovely. I would be in heaven with these puffs. Okay all of the puffs including the cat - what a cutie! I like your puffy tales and pastry puffs filled with mushrooms sound wonderful. Awww, these puffs look tasty. Your cat is adorable!!! I love it! It's like the elegant, sophisticated cousin of the fried mushroom! awwww... such a cute little kitty! and aren't puffs the most versatile food item out there?! i swear we can fill it with so many diffeernt fillings... it can be sweet or savory. i really like your mushroom version. they must taste unbelievable! Now these are truly puffs, filled with a savory treat. I want to make this and I love the two different mushrooms that you used. I can just taste them. Sweet kitty, too. The mushroom puffs look divine. I love the filling for the puffs, so much flavor. The kitty is so cute. Haha awww Jiji is too cute! Love those little paws! And your mushroom puffs sound delicious, I'm so excited for fall to roll around so I have more excuses to make tasty appetizers like these! Jiji is really cute and those mushroom puffs look so good! Mushrooms + puff pastry are a divine combo! These look amazing! What a gorgeous kitty! I love both puffs! The cute, furry ones and those delectable, flaky ones! Although I love mushrooms, it never occurs to me to bake puffs with mushrooms! This is a brilliant idea (or I never had it before). Perfect afternoon snack with my kids! 1. How could you not love those little kitty paws; they're too cute. 2. These puffs look airy and delicious. I love the stuffing. Savory herbs and mushrooms- um, yum! Puff makes it sound light, airy, and calorie free. Can we pretend that's true of puff pastry? The mushroom filling sounds fantastic, and I love the idea of dipping these into creme fraiche. Porchini AND cremini?!?!??!!? Oh, HECK yeah! These puffs will be gone quickly at my house. There is so much mushrooms and great ingredients all packed in these light pillow-y pastries. Yum! These would be so great as a dinner party appetizer! Ooh. Any food with the word puff in it is on my must-have list! Love these. Isn't puff pastry wonderful? There is so much to do with it. I love this combination and bet it is wonderful. Thanks for sharing. Aww, your JiJi and my Rascal look so much alike! 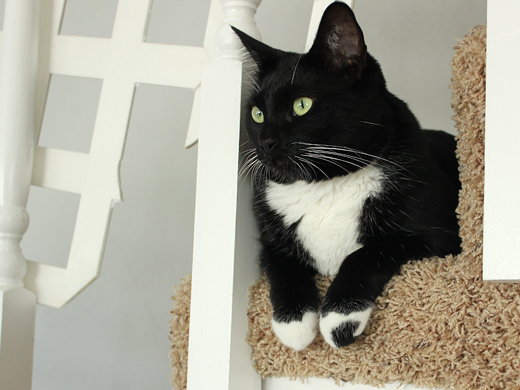 Rascal also has small white mitten paws =) Love this recipe as well! Your mushroom puffs look awesome. Puff pastry is one of the best ingredients, ever.